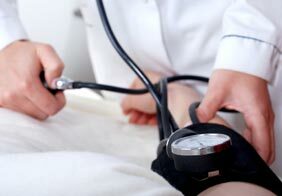 There is uncertainty about the best management strategy for elevated blood pressure after the onset of acute ischaemic stroke. Studies have suggested that very high blood pressure makes good recovery from stroke less likely, and possibly increases the risk of bleeding in the brain. Therefore, various guidelines written by international experts recommend that the systolic (‘upper’) level of blood pressure is kept below 185 millimetres of mercury (‘mmHg’) before rtPA is given, besides this there are no other recommendations due to lack of data. However, more recent research suggests that a lower level of blood pressure may offer the best chances of recovery after the use of rtPA for acute ischaemic stroke. Studies have shown that the best chance of recovery occurs when the blood pressure is at a systolic level between 140-150 mmHg, which is generally considered to be near the ‘normal’ range level in an otherwise healthy person, at the time of and for at least 24 hours after use of rtPA. The studies have also shown that a poor outcome from stroke also occurs when the blood pressure is very low, that is less than 130 mmHg. Having high blood pressure after ischaemic stroke, and especially when rtPA is used, may increase the risk of bleeding in the brain because the blood vessels are damaged and the brain cells are injured. Therefore, the rapid lowering and persistent control of blood pressure to a target of 130-140 systolic level may have beneficial effects by reducing pressure on injured blood vessels and increasing blood flow in healthy blood vessels in the brain, but this is not known definitely. There may be risks of more intensive blood pressure lowering, to the brain and other organs in the body, but these appear to be small and reversible with treatment. Of course, such treatment may not provide any benefits at all to patients, with elevated blood pressure being only a reaction to the stroke, much like a fever, for which control is not necessary. It is important that research studies provide an answer to this question, as elevated blood pressure after acute ischaemic stroke and when using rtPA, often causes concerns to doctors, nurses, patients and their families. As there are a lot of different, low-cost, drugs available around the world to control blood pressure, the treatment could be low-cost and simply applied to benefit patients by improving their chances of recovery after stroke. All of the drugs to be used in this study, including rtPA and blood pressure lowering drugs, are routinely available and approved for the treatment of stroke and high blood pressure in Australia and other countries. The study is being conducted in Australia and in other countries around the world. It has been designed, and is being conducted, by doctors and medical research scientists at The George Institute for Global Health, a medical research institute affiliated with the University of Sydney, in collaboration with similar people around the world. The study is being conducted completely independently of any pharmaceutical company. A total of 4800 people will be recruited to participate in this research study from hospitals around the world.